The new Cat® 314E L CR hydraulic excavator is designed for customers requiring a powerful, versatile, fuel-efficient, 14.5 to 17.1 metric-tonne machine with the compact dimensions to work productively on space- restricted job sites. The new model meets European Union Stage IIIB emissions standards and features a fuel-flexible engine, efficient hydraulic system, choice of booms and sticks, refined operator’s environment and easy serviceability. The compact-radius design of the new 314E L CR also keeps the upper structure completely within the machine’s footprint — a design that combines with limited over-side extension to significantly reduce the risk of damaging the machine or surrounding obstacles when the machine swings. Operators work more confidently and more productively. The Cat C4.4 ACERTTM engine powering the 314E L CR develops 91 net horsepower (67 kW) and can use either ultra-low- sulphur diesel fuel (ULSD) or a bio-fuel blend of ULSD and up to 20 percent bio-diesel (B20) fuel meeting EN14214 standard.The engine provides two power modes, high and economy, to best match operating situations with efficient fuel usage. An On-Demand Engine Power feature keeps engine speed low during light work and idling to conserve fuel but automatically increases speed when loads increase. For added fuel savings, the Engine Idle Management system shuts down the engine after a specified time interval. The 314E L CR’s hydraulic system combines power and efficiency to provide high production with excellent fuel economy.The main pumps, located side by side, are driven directly from the engine for maximum efficiency, and the electrically controlled regeneration valve in the boom-down circuit saves fuel and minimizes heat by recycling oil between boom-cylinder ends, eliminating the necessity to pump the required oil. The main control valve is designed to work with any tool (quick-couplers, buckets, grapples, plate compactors, shears, or hydraulic hammers — for example) to greatly expand the 314E L CR’s versatility. Productivity can be enhanced with the optional quick coupler. At the foundation of the new model are rugged mainframes, and a long, well-balanced undercarriage that features double solid-pin- type track rollers set in massive track frames. Two counterweight options are available, 3.06 and 3.56 metric tonnes, to optimally match the machine to digging and lifting chores. Three types of booms are available: a reach type for all-around versatility, a variable angle boom for super flexibility and versatility in the working envelope, and a power offset type for added production in restricted spaces. Depending on the boom choices, different optional sticks are available to provide the best match for situations typically encountered. The refined operator’s environment features mechanical and air-suspension seat options with available heating and cooling for the ultimate in operator comfort year-round. The 314E L CR provides an automatic climate-control system, and the high-resolution monitor also serves as screen for the rearview camera. Large glass areas, including an expansive skylight and the rear view camera, provide all-around visibility to promote safe operation. Intuitive controls simplify operation. 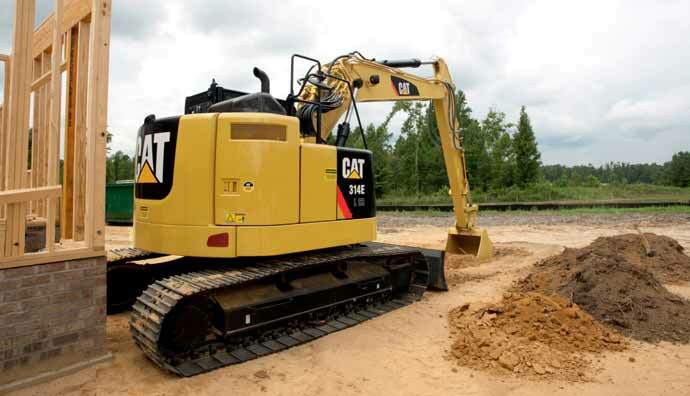 Overall machine efficiency is further enhanced with the optional Cat Grade Control Depth and Slope system, which allows operators to more quickly cut and fill to specification. Also, the optional Product LinkTM system can report diagnostic codes, hours, fuel consumption, location and other pertinent information to a secure, web-based application (VisionLink®). Maintenance efficiencies include ground-level access to service points and side-by-side mounting of radiator and oil cooler, with charge-air cooler and A/C condenser set forward.